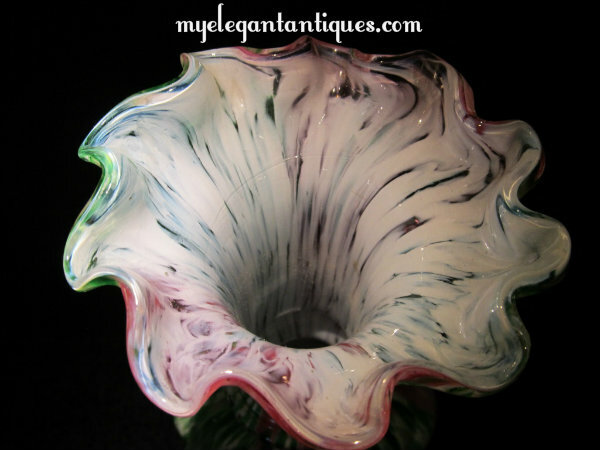 We are pleased to feature this large and highly customized vintage hand blown art glass vase from the skilled artisans on the island of Murano, Italy. 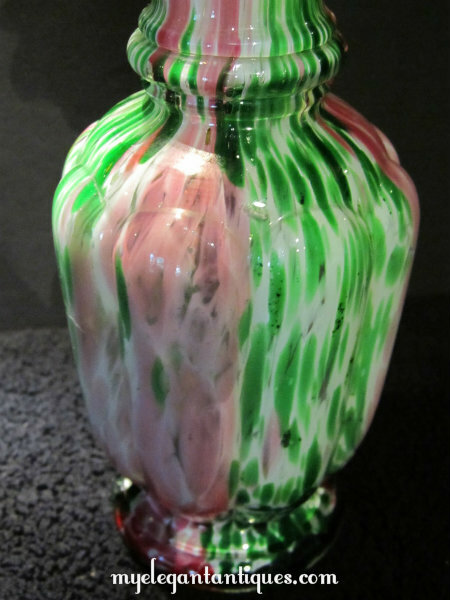 The the rim of this Vintage Murano Art Glass 1960's Pink & Green Spatter Vase is both varied and complex: it features a classic hand blown collar base, lobed panelling with a renaissance staged ring neck, and a wide, flared deflecting roll crimped rim. The use of pink, green, & opalescent white for the alternating column-pulled colors is dynamic and alive! 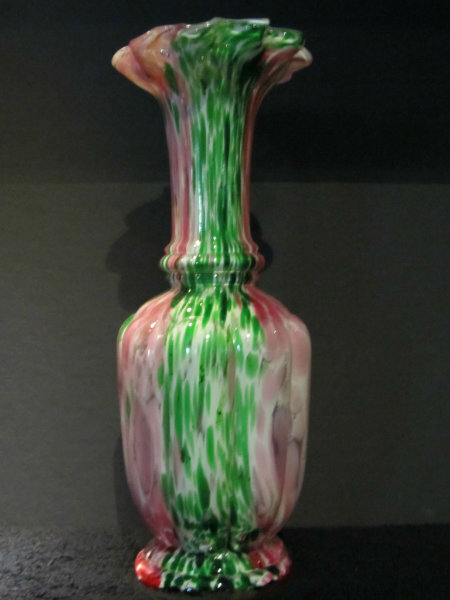 This Vintage Murano Art Glass 1960's Pink & Green Spatter Vase With Wide Flared Crimped Rim is in excellent vintage condition, with very minor wear given that this wonderful piece is 40 to 50 years old. 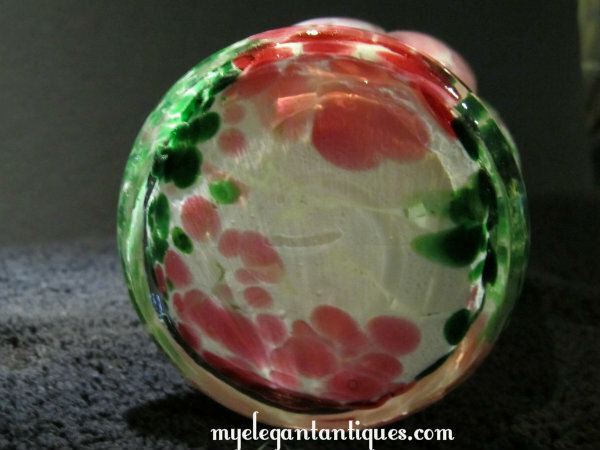 The Vintage Murano Art Glass 1960's Pink & Green Spatter Vase With Wide Flared Crimped Rim weighs 1 lb 7 oz., and measures 3-1/4" in diameter at the base, and is 9-3/4" in height. 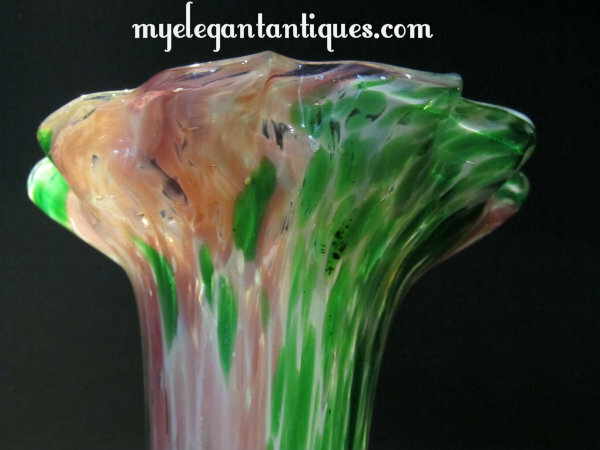 This vivid and dynamic Vintage Murano Art Glass 1960's Pink & Green Spatter Vase With Wide Flared Crimped Rim is a treasure for any art glass or Murano collection. BRIEF HISTORY: Glassmaking in Italy originated in the 9th century with significant Asian and Muslim influences, as Venice was a major trading port. Murano became a center for glassmaking in approximately 1291 when the Venetian Republic, fearing fire and destruction of the city (most buildings were primarily made of wood) ordered glassmakers to move their foundries to Murano. Murano glassmakers were soon the island's most prominent citizens, and by the 14th century, glassmakers were allowed to wear swords, enjoyed immunity from prosecution, and married the daughters of Venice's oldest and most affluent families. However, in order for the Venetian Republic to maintain its monopoly in glassmaking, glassmakers were not allowed to leave the Republic. Murano glassmakers developed or refined many glassmaking techniques, including the production of crystalline glass, enameled glass (smalto), glass with threads & inclusions of gold (aventurine), multicolored, embedded glass (millefiori), spiraling canes (latticino) and milk glass (lattimo). Today, the artisans of Murano are still employing these century-old techniques, crafting everything from contemporary art glass and glass figurines to Murano glass chandeliers. See this gorgeous piece on our Facebook page and 'Like' us while you are there!